OU Osmania University MBA Programmes admission 2017 notification: Osmania University has given the MBA Programme admission 2017 notification and OU, Hyderabad invites applications for admission into following courses for the academic year 2017-2018. So, eligible working employees / executives can apply for admission into the following Evening programs offered at Dept. of Business Mgmt. Osmania University Campus for the academic year 2017-18. 1. MBA (Technology Management: Two years Evening Program): for working Executives (admission through entrance test). 2. MBA (Evening: Part-Time)(MBA Three years Evening Program): for working Executives (admission based on TS ICET-2017 Rank). (c) Admission is based on TS ICET -2017 Rank). The entrance test for the course (1) will we conducted on 13.08.2017. Further details, including applications, Information Brochures, registration fee to be paid, etc., are made available in OU websites, www.osmania.ac.in and www.ouadmissions.com. The last date for application is 11.08.2017 by 4.00 pm. 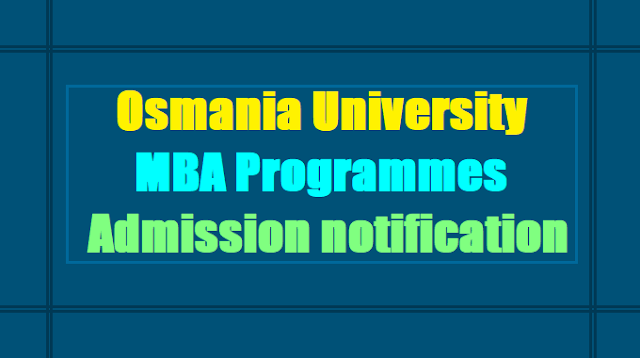 Application form, Information Brochure, are available in Osmania University websites: www.osmania.ac.in and www.ouadmissions.com. Applications can be had from O/o The Coordinator, MBA Technology Management, Dept. of Business Mgmt. OU Campus and also from The Director, The Directorate of Admissions, OU. The last date for application is 11.08.2017 by 4.00 pm.